Delve Into the Earth or Explore the Universe. And Bring the Kids! While the Dallas area is rife with art museums and chic boutiques, it also offers a variety of fun activities for families. Go on a safari, see a sea dragon, ride on a roller coaster, or take a trip through the solar system. It’s all here, so come discover the Big D.
Where, oh where to plan a family vacation? Travel on land or swim in the sea? Stay in the city or explore the wild? Surprisingly enough, we found it all in one place—Dallas, Texas. With its world-renowned Arts District, famous sports teams, and five-star restaurants, Big D has always been a draw for savvy adults. Now, thanks to family-friendly venues, this shining city on the prairie will keep the whole crew happy. Lions and tigers and ... bongos? Oh my! The Dallas Zoo has undergone an incredible transformation over the last 20 years and now ranks as one of my favorites in the state. From our downtown hotel, it was easy to take the DART Red Line to the Dallas Zoo station. No traffic, no parking, no problem. Once we had gained entry, our first stop was a visit with a herd of mature female elephants—known to the staff as the “Golden Girls”—in their cleverly designed habitat. A large, wide-ranging savanna, the enclosure keeps the animals active by letting them move around and “hunt” for food and water. For $5, we fed giraffes while standing on a man-made ridge that put us eye to eye with these long-necked, doe-eyed creatures. We then watched Gummy and Tekin—the only koalas in Texas—take a “walkabout” in their climate-controlled habitat. Ready for a break, we stopped by the Stream, a playscape designed to look like a forest creek. We relaxed in the shade as the kids crawled in and out of (replicas of) giant tortoise shells and bounced around on a trampoline that resembled a spiderweb. 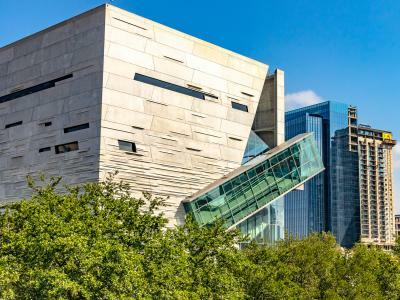 Located in the West End Historic District (home to the JFK Sixth Floor Museum), the Dallas World Aquarium is known throughout the world for its conservation efforts, particularly with saving endangered manatees in Peru. While that fascinated the adults, the kids were all about the funky-looking fish. We saw hundreds of them as we walked the tunnel that runs through a 20,000-gallon tank. There were seahorses, weedy sea dragons, and mandarin dragonets, as well as hulafish, sniper fish, and starfish. The kids laughed at the clownfish (like Nemo), but it was a clown triggerfish—its dark body decorated with big white spots and a yellow nose and tail—that made me giggle. Other exhibits included Mundo Maya, with storks, flamingos, hawks, and owls, and Borneo, with its cockatoos and kangaroos. The South American rainforest exhibit Orinoco, however, had the most of what we’d never seen before, including two- and three-toed sloths, toucans, howler monkeys, one anaconda, and a giant, bird-eating spider—now starring in my nightmares. Leaving the aquarium, we walked through the West End to find a late lunch. We chose Gator’s, a family-friendly eatery, and chowed down on all-you-can-eat catfish on the rooftop patio. It was difficult making my science-loving husband wait until the third day of our vacation to visit the Perot Museum, and once we got there, I almost couldn’t get him to leave. The kids were just as fascinated. The building is an enormous gray cube, with five floors, 11 exhibit halls, a children’s outdoor play space, and a 3-D theater. Walking into the main lobby, we met a 35-foot fossil of a Malawisaurus—a serpentine-necked dinosaur from the Early Cretaceous Period. After that, all the exhibits were either hands-on, multimedia, interactive, animated—or all of the above. We started in the Being Human Hall. The kids went to the Bio Lab, got decked out in lab coats, and learned how to scrape for and analyze cheek cells. I played a game that showed me how certain food and activity choices affect my life expectancy. The Earthquake Shake Experience demonstrated what a magnitude 5 might feel like compared to a magnitude 7. Our 3-D-animated trip through the solar system made a pit stop on Mars, after which we took turns mastering the laser obstacle course, bouncing a laser beam off mirrors to hit a target. This attraction is about 30 minutes west of Dallas, but it’s a classic. I went there with my cousins when I was a kid, but the Six Flags we found on our last visit was even bigger and better than I remembered. There were several different roller coasters, including the Judge Roy Scream, a giant wooden coaster with a six-story drop, and the Shockwave with double loops and speeds up to 85 miles per hour. For the smaller tykes, automated hot-air balloons of the Cloud Bouncer took them safely up, but not away. While we were there, construction was in progress for the park’s newest ride—Justice League: Battle for Metropolis. Described as a trip through a 4-D video game, the ride will feature the latest in special effects, graphics, surround sound, video, and animatronics. Riders will have a digital “stun gun” to battle the bad guys along the way. The Dallas Aquarium partners with several international organizations to help protect, conserve, and rehabilitate the endangered Amazonian manatee. While manatees have large, walrus-shaped bodies and live in the water, they are mammals, not fish. In fact, their closest living relatives are the elephant and the aardvark.